SAINT-QUENTIN-EN-YVELINES, France — Brooks Koepka expressed sympathy for a spectator who sustained a nasty facial injury when she was struck by a tee shot from the American here Friday at the Ryder Cup. 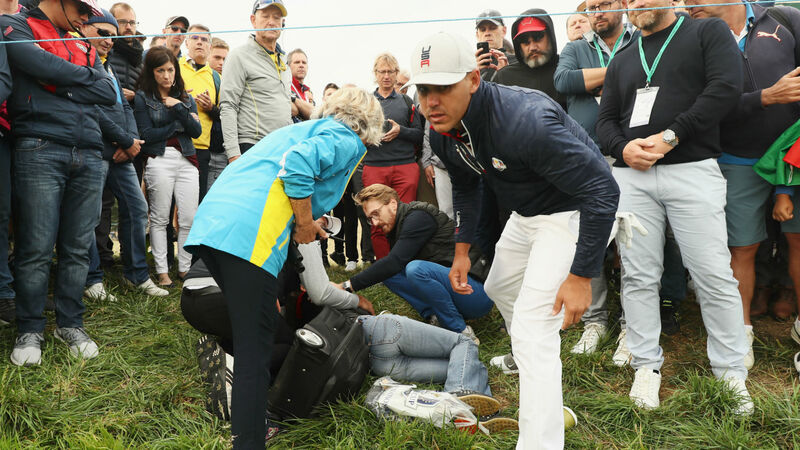 During the morning fourballs at Le Golf National, which ended with the USA up, 3-1, Koepka’s tee shot at the sixth hole hit a woman in the crowd. The spectator was left bleeding heavily and required medical treatment. After teaming up with Tony Finau to beat Justin Rose and Jon Rahm, Koepka confirmed that he had yet to receive an update on the injured woman’s condition. “I actually just asked in the locker room, and nobody knew. So I have no idea what’s going on,” said the three-time major champion. “I obviously saw her. It looked like it hurt. She was bleeding pretty good. It looked like it hit her right in the eye, so hopefully there’s no loss of vision or anything like that. “It’s not a fun feeling. I probably do it way more than I should. It seems just about every week we’re hitting somebody, and, you know, it’s unfortunate. You’re never trying to. Asked if he or anyone else in his group had shouted fore, Koepka replied: “I think we all shouted fore. “The problem is, you shout fore, but from 300 yards, how are you supposed to hear it? How are you supposed to know? Can Tech Help Improve Conditions For World Cup Workers In Qatar?